We all know the standard JFace icons very well. They appear in Dialogs, Wizards and Forms. Now, there is a quick and easy way to replace them with your own icons if you like. Interesting fact: You can replace the JFace icons with PNGs too. You can just rename them to have the .GIF extensions. The image file loader of SWT does not care about the extension but analyses the content of the file. 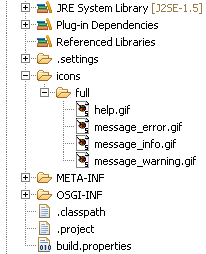 Hey Philipp, thanks for this post - it works well with the given example to replace the org.eclipse.jface icons. But when I try the exact same procedure with one of my plugins (also with an icon folder), the fragment's icon is only displayed when I delete the host's icon - otherwise always the host's icon is shown :( Do you have any idea?